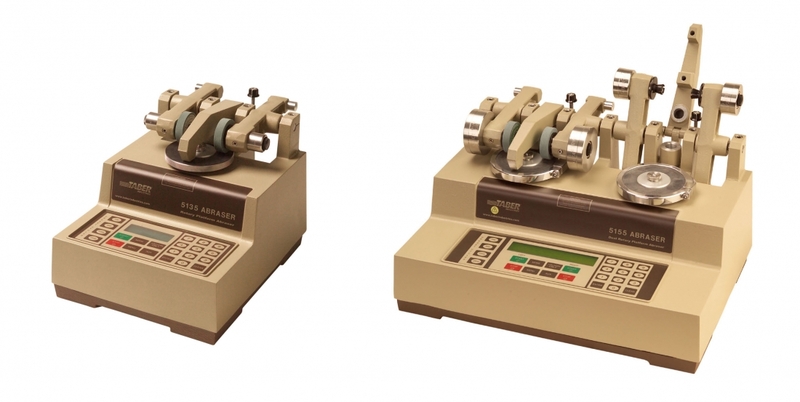 The TABER® Rotary Platform Abrasion Tester - Model 5135 or 5155 is commonly referred to as the Taber Abraser (Abrader) or Rotary Platform Dual (Double) Head Tester. First introduced in the 1930's, this precision built instrument was developed to perform accelerated wear testing. Capable of providing reliable data in a matter of minutes compared to the years that may be required by in-use testing, the Taber Abraser (Abrader) rapidly became the world standard for evaluating abrasion resistance. Since its inception, the Taber Abraser has been used for quality & process control, research & development and material evaluation. Used to test a wide spectrum of materials, the instrument has been referenced in numerous standards and specifications (including plastics, coatings, laminates, leather, paper, ceramics, carpeting, safety glazing, etc.). Taber tests involve mounting a flat specimen approximately 100mm square or round to a turntable platform that rotates on a vertical axis at a fixed speed. The standard material thickness that can be evaluated with the Taber Rotary Abraser is 6.35 mm (materials greater than 6.35 mm but less than 40 mm can be tested with optional accessories). Two genuine Taber abrasive wheels, which are applied at a specific pressure, are lowered onto the specimen surface. Characteristic rub-wear action is produced by contact of the test specimen against the sliding rotation of the two abrading wheels. As the turntable rotates, the wheels are driven by the sample in opposite directions about a horizontal axis displaced tangentially from the axis of the sample. 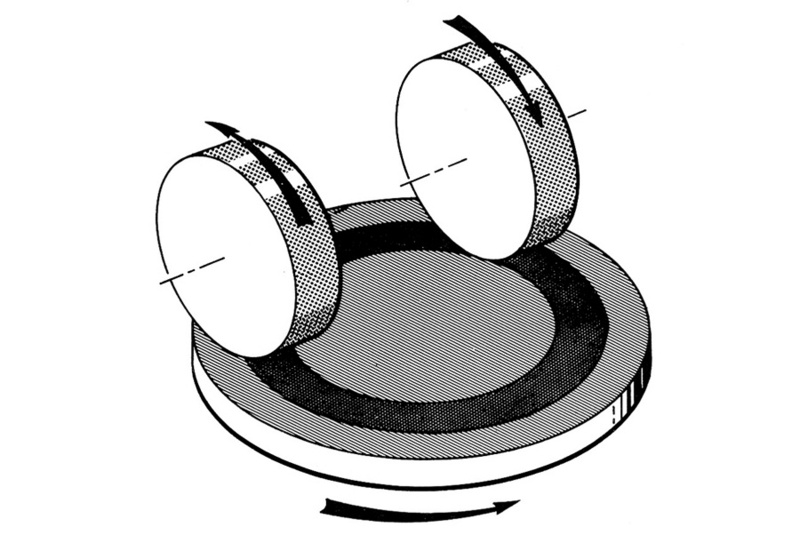 One abrading wheel rubs the specimen outward toward the periphery and the other, inward toward the center while a vacuum system removes loose debris during the test. The wheels traverse a complete circle on the specimen surface, revealing abrasion resistance at all angles relative to the weave or grain of the material. The resulting abrasion marks form a pattern of crossed arcs in a circular band that cover an area approximately 30 cm2. Each turntable has dual abrading arms that are precision balanced. Independently operated, the abrading arms can be raised (or lowered) to mount or inspect specimens. Each arm is precision balanced and will apply a load of 250 grams against the specimen, exclusive of the weight of the wheel. To increase the load to 500 or 1000 grams, a mount for auxiliary weights is located on the outside of the abrading wheel bearing assembly. This location ensures that weights are concentric with the abrading wheel. A stud on the rear end of the abrading arm is used to carry an optional counterweight (used to reduce the load by 50, 125, 150 or 175 grams). Easy-to-use operator interface that includes tactile feel buttons and a four line digital display. Simple on-screen instructions allow the operator to change the test parameters via the MENU button. An internal memory stores the settings. A vacuum system is included and is critical for the proper operation of the instrument. The vacuum nozzle(s) is hinged to an adjustable mounting at the rear of the housing. A precision vacuum nozzle adjustment control allows the height to be modified for accommodating varying specimen thickness. The abraser arm provides a standard load of 250 gram on the wheel. Using the auxiliary weights, standard wheel loads of 500 or 1000 grams can be obtained. Please note, the markings on the auxiliary weights are NOT reflective of the actual mass of the additional weight. The auxiliary weights are marked with the TOTAL load that will be exerted on the wheel and equals the combined mass of the abraser arm and auxiliary weights. The weight marked 500 gram is 250 grams and the weight marked 1000 gram is 750 grams. Assembled in a sturdy, sealed aluminum housing. The TABER® Abraser (Abrader) is available in two models - single or dual specimen tables. Both offer the same durable design and can be used interchangeably. Model 5135 features a single specimen turntable. 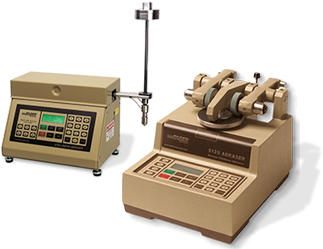 Model 5155 features two specimen turntables, allowing you to perform two tests simultaneously (test two different or identical specimens for comparison or contrast). Separate function keys operate the turntables independent of each other. For information on Genuine Taber wheels, click here. There are various techniques used to interpret results generated with the TABER Rotary Platform Abraser (Abrader). The method of evaluation that you select should reflect the type of material that is being tested. If you are following a specification - the method for interpreting test results will be listed. Cycles to a Specific End-Point - The number of cycles required to reach a predetermined end point, or the appearance or condition of the specimen after a fixed number of cycles. The evaluation criteria may include: loss in breaking strength, yarn breakage, loss in coating, change in gloss, color loss, or other changes in appearance. In these cases, the abraded sample is usually compared to a known standard of the material tested. When visually inspecting changes in specimen appearance, evaluations should be made using an agreed upon rating system such as a visual grading scale (e.g. five-step) or pass/fail criteria. Weight (Mass) Loss - This technique measures how much material has been removed by abrasion, and is usually reported in milligrams. When performing the weight loss method, loose particulate may adhere to specimens during testing. It is critical that you clean off the test specimens as best as possible prior to weighing. Taber Wear Index - Indicates rate of wear, and is calculated by measuring the loss in weight (in milligrams) per thousand cycles of abrasion. The lower the wear index, the better the abrasion resistance. Volume Loss - When comparing the wear resistance of materials that have different specific gravities, a correction for the specific gravity of each material should be applied to give a true measure of the comparative wear resistance. Calculate the wear index as shown above, and divide the result by the material's specific gravity. The use of this correction factor provides a wear index related to the loss in volume of the material to which it is applied. When comparing materials of different specific gravities, test parameters must be the same including wheel selection and load. Wear Cycles Per Mil (0.001 inch) - Used to express abrasion cycles required to wear through a coating of a known thickness. Depth of Wear - To determine the depth of wear, use a thickness gauge or other appropriate device to measure the specimen thickness on four points along the path to be abraded, approximately 38 mm from the center hole and 90° apart. Calculate the average of the readings. After subjecting the specimen to abrasion, repeat the measurements and average the readings. Calculate the difference. Alternatively, the depth of the wear can be measured with an instrument such as an Optical Micrometer. Residual Breaking Force (textile fabrics) - This technique measures the effective strength of the fabric, or force required to break a specific width of fabric. To determine the individual breaking force of the abraded specimen use the procedure described in the ASTM D5034 and D5035 Standard Test Method for Breaking Strength and Elongation of Textile Fabrics. [Note, you must change the referenced distance between clamps to 25mm and horizontally place the path of abrasion on the abraded specimen midway between the clamps.] Report the breaking load to the nearest 0.5kg. Average Breaking Strength (textile fabrics) - Calculated by averaging the breaking strength of the abraded specimens and the unabraded specimens, as determined by the Residual Breaking Force. Percentage Loss in Breaking Strength (textile fabrics) - To determine the breaking load of the original fabric and the abraded specimen, use the procedure noted above (ASTM D5034 and D5035). Calculate the percentage loss in breaking strength to the nearest 1% for each lengthwise and widthwise directions. The following links provide a listing of test methods the Taber Abraser (Abrader) satisfies. Please note, additional accessories may be required.